The Puli is one of the most ancient breeds known to man. The breed name is derived from the Puli Hou, the “Destroyer Huns” of Asia. The Puli is very much like the Tibetan Terrier in body type and instincts. Asian influence is noticeable in the Pulik (plural for Puli) body and coat, and especially the tail curled over the back. The Pulik crossed the plains into Hungary with the Magyars several thousand years ago and were used as sheep dogs. Shepherds seemed to prefer the black dogs probably because they were easier to spot in a flock of white sheep. The Puli worked alongside the Komondor. The Puli was the herding and droving dog because of its light, agile movements, while the Komondor, the larger Hungarian breed, was used more as a guarding dog for the flocks. The Pulik working abilities was of utmost importance, and if the dogs produced from a litter did not match up to the standards, they were just “plain dogs” and not kept. This process produced the intelligent and healthy breed that we have today. Like many breeds, this dog almost became extinct during the World Wars due to lack of food and medical supplies. However, just as the Puli survived the harsh plains of Hungary, they beat the odds, and after the War, the number of Puli grew not only is size but in popularity. The Puli is a family dog, rather than a one-person dog who loves to be part of all the activities. They are so intelligent that some people believe their Puli is smarter than they are! They make wonderful jogging or hiking companions, as they have lots of energy and love to spend time outdoors. These dogs also act like puppies for their whole lives. They make ideal playmates and guardians for children, often herding them to where they want them to go. Pulik want to understand and please their owners; however, if they get bored they can become destructive, and they have also been known to be manipulative to get what they want. Pulik make great watchdogs and will alert you to any danger. These dogs can be very independent and will need a firm owner to make them do what is expected. However, they make a wonderful family addition as they like to play games and have fun. They also are sensitive to people’s moods and feelings and will often show empathy. The Puli usually weighs between 20 to 35 pounds and stands approximately 14 to 18 inches tall. They are a medium-sized dog with a sturdy and muscular build. 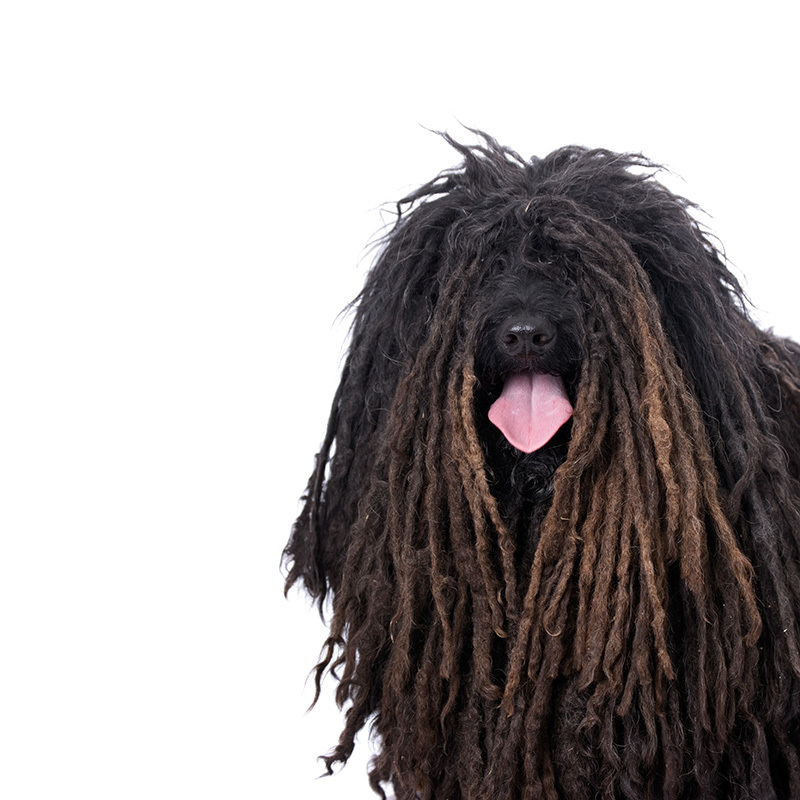 Resembling a rag mop, these dogs have a truly bizarre collection of usually-black, shades of gray, or white dreadlocks that covers their eyes. However, you can comb their hair out to have a wooly afro if you’d rather!